Apple today introduced a Pro Apps Bundle for Education that includes Final Cut Pro X, Logic Pro X, Motion 5, Compressor 4, and MainStage 3 for $199.99. The software bundle is available for teachers, faculty, staff, and students at universities, colleges, and K-12 schools in the United States, as reported by The Loop. The total cost of Final Cut Pro X ($299.99), Logic Pro X ($199.99), Motion 5 ($49.99), Compressor 4 ($49.99), and MainStage 3 ($29.99) is usually $629.95, so the bundle offers educational customers over $400 in savings. The bundle must be purchased through the Apple Store for Education. After purchasing the bundle, education customers will receive an email with codes to redeem the apps on the Mac App Store. Apple says codes are usually delivered within one business day, but may occasionally take longer. 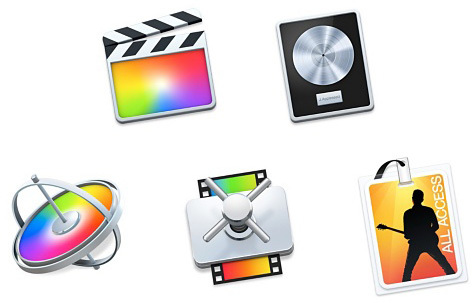 Final Cut Pro X is Apple's professional video editing software, while Logic Pro X is its professional audio workstation for advanced music production. Motion 5, Compressor 4, and MainStage 3 are companion tools for creating 3D animations and effects, customizing output settings, building set lists, and more. Update: Apple has confirmed that its Pro Apps Bundle for Education is coming soon to countries outside the U.S. that offer an Apple Online Store for Education, such as Australia, Canada, and the United Kingdom. I didn't expect that Apple would do this but it's great that they have, but it would be better if they brought Aperture back. Good initial step but it's going to take a helluva lot more than this to staunch the profuse bleeding of their education market share to Google. It's impossible. Google (or Microsoft) will dominate the public education market over the next decade. Apple hardware is simply too expensive for schools. When budgets are as tight as they are for most school districts, the fact that you can get 5 chromebooks for the cost of one MacBook Air means it would be terribly foolish for schools to buy macs. Apple - Please allow developers to make bundles on the Mac App Store! Been on iOS for a while. I work at a US university. If you're referring specifically to institutional purchases for computing labs, there's some truth in what you say. But as far as people on campus go - if you walk into any space where a bunch of people are working on their laptops*, you'll see a TON of Macs. Most of the rest are Windows laptops, although not many are actual Microsoft-branded devices (e.g. Surface). I see quite a few of the Yogas, which I must say are pretty nice hardware. *I'm mainly around engineering and computing areas. It's possible other disciplines might not be as dominated by Macs... I just don't know. Still expensive. When you work in education, most software via education discount is either free, costs few dollars or has %90-95 discounts, so paying $200 for this 'education' discount is still a typical rip off in Apple's fashion!!! I don't know what "sense of entitlement" reality show you have been tuning into but, there is certainly no financial ripoff happening with this app bundle. Apple does not owe you special treatment. Apple: "Please take our abandon-ware to run on our overpriced abandoned computers"
That may be if you look at hardware cost alone, but it is cheaper to own a Mac when you factor in service, support, and security.